As we reach the end of the year, I want to thank you for your engagement and enthusiasm for showing our world, one drawing at a time. Thank you also for sharing your ideas, questions, comments, and concerns over this past year. It’s truly an honor to serve you, Urban Sketchers, in your 10th year. I look forward to continuing to do so in 2018. In 2017 we did so many exciting things! 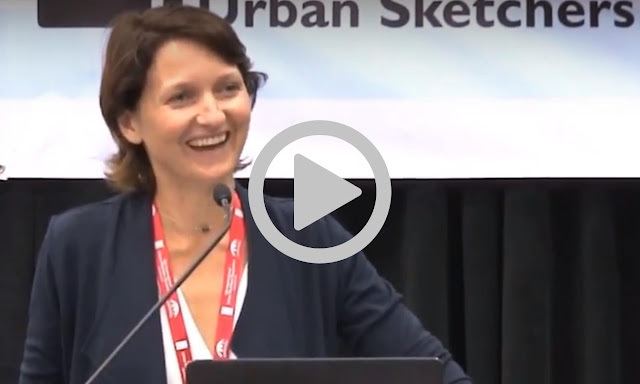 Nearly 600 sketchers from 34 countries came together at the 8th Urban Sketchers Symposium in Chicago, USA. The 10x10 courses provided 310 classes in on-location drawing education in 31 cities. Urban Sketchers instructors led 30 workshops around the world. Get involved in our educational mission in 2018 by hosting, leading or attending a 10x10, workshop or Symposium! The Call for Proposals is now open for the 9th Urban Sketchers Symposium in Porto, Portugal. We are always looking for new and exciting ideas and new instructors to share their talents with our community. There are plenty of tips and guidance available to help you create a successful submission. The Symposium will be held 18-21 July 2018. I am excited to share that the executive board has added a new member. 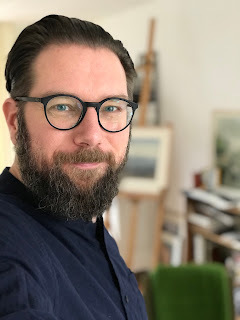 Joining the board as Events Director is Wiltfried Pathuis of Urban Sketchers Netherlands and Urban Sketchers Groningen. He is a passionate sketcher and full of wonderful ideas! Keep scrolling to see an introduction to Wiltfried here in this issue of Drawing Attention. Lastly, I’ll end with thanks to everyone who participated in the 24hr Sketchwalk on our 10th Anniversary, 11 November 2018. I’d like to recognize the great group of volunteers who managed the Instagram side of the event: Eric Ngan, Minjoo Yoon, Ben Luk, Bindi Nasasira, Christina Wald, Liz, Vargas, and Don Gore, and Brenda Murray and Noga Grosman for their work on event planning. Thank you for your important role in connecting our global community. Happy sketching, and warmest wishes to you all in the final days of 2017! Reminder, the call for symposium programming went out on November 15. The deadline is December 15. For more information, click HERE. 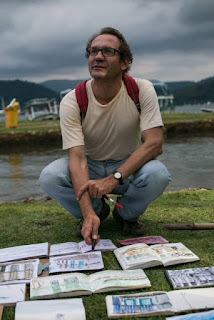 Urban Sketchers organizes workshops taught by our top instructors in collaboration with USk chapters around the world. 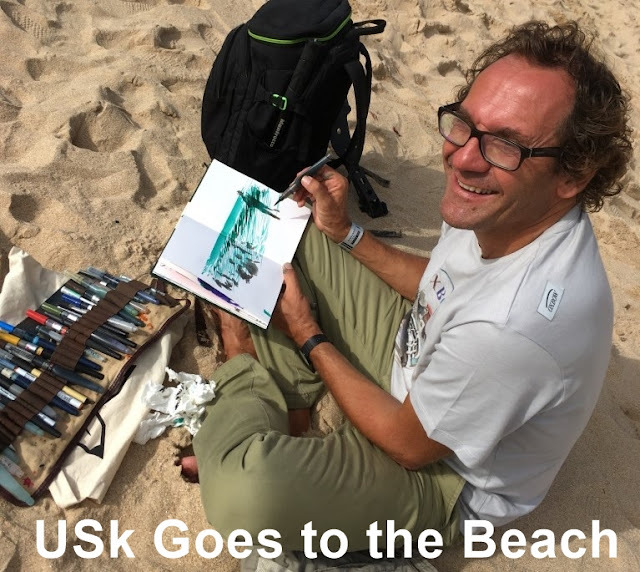 If you would like to bring an official USk workshop to your chapter, start the conversation with our Education Director, Mario Linhares at education@urbansketchers.org. 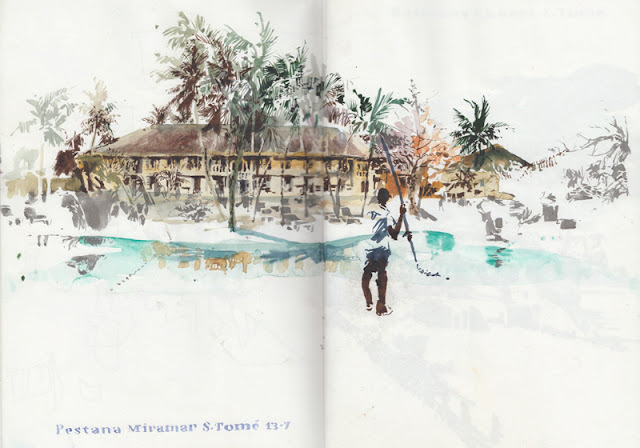 On November 30th, Omar Jaramillo in Berlin, Don Low in Singapore, Uma Kelkar in San Francisco and Rob Sketcherman in Hong Kong organized iPad Sketchwalks sponsored by Apple. For more information about this exciting event, check the Apple Newsroom. In celebration of our 10th anniversary in 2017 Urban Sketchers, in partnership with the Tourism Office of Portugal (TP), have organized a sponsored sketching trip called Sketch Tour Portugal. 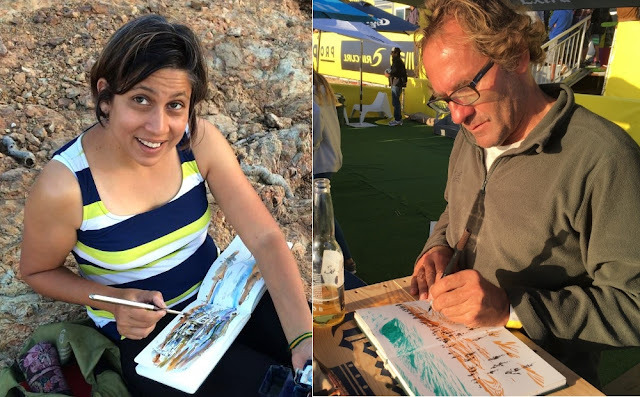 From Dec 27, 2017 to Jan 2, 2018, USk and the TP will send Ea Ejersbo from Aarhus, Denmark and Portuguese host Ketta Linhares from Lisbon to sketch in Madeira, Portugal. The sketchers will sketch a minimum of 6 drawings per day. 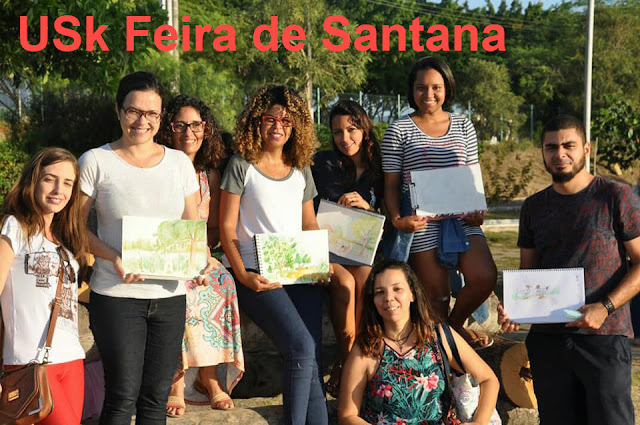 The TP will use sketches made during the trip to promote Portugal in different events such as at fairs, in postcards, on social media, and at exhibitions. We wish Ea and Ketta happy travels and happy sketching! Urban Sketchers would like to welcome to the Executive Board Wiltfried Pathuis as Events Director. Wiltfried lives in Veendam, The Netherlands in the province of Groningen. He is the Regional Administrator of Urban Sketchers Netherlands and also an admin of a local sketch group in Groningen. Wiltfried is a research scientist/innovator at TNO (Netherlands Organisation for Applied Scientific Research). 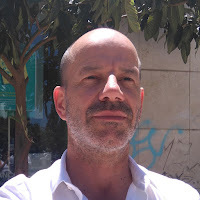 Wiltfried will be responsible for coordinating the planning and execution of the USk Symposium and all major USk events. 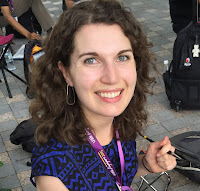 Urban Sketchers would like to welcome our new Social Media Coordinator (SMC), Noga Grosman from Orlando, Florida. 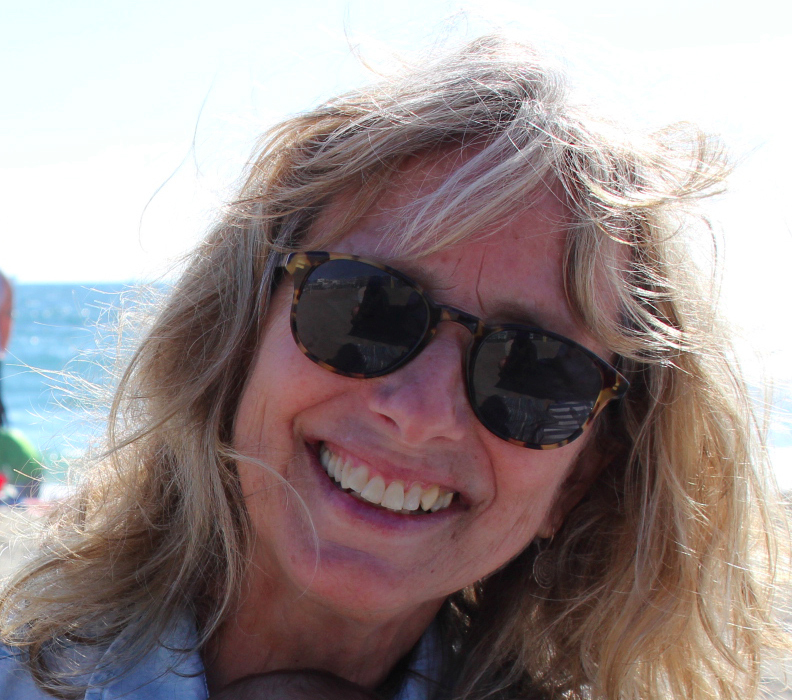 Noga is the founder and Admin of USk Orlando and a retired Residential Architecture designer who worked in both Israel and Florida for 30+ years. Noga has non-profit and social media campaign management experience. Reporting to the USk Communications Director, Noga will lead a team of volunteers responsible to promote the organization, our values, events and programs on USk social media platforms (Twitter, Instagram, Facebook and Flickr). The world has now seen ten years of urban sketching! Yes, it’s been a decade since Gabi Campanario opened up a Flickr account for a myriad of sketchers that would become the touchstone of the worldwide movement. That’s a very short time, considering the incredible number of chapters actively sketching around the globe to this date. Not surprisingly, the Global 24 Hour Sketchwalk on the 11th of November was a tremendous success, with 106 groups - not all official USk chapters yet - registering and a few more unregistered taking part. 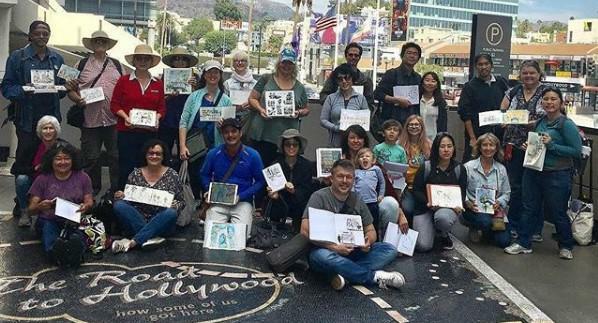 All chapters were assigned a fixed time slot, during which their sketches and photographs posted in the social media under #USkGlobal24hrSketchwalk, would be reposted on the official USk Instagram account. Hundreds of images of happy sketchers made it online during the 24 hour period, from Auckland, New Zealand to O’ahu, Hawaii, USA. Thousands of sketchers also posted on their own, with individual posts under the official hashtag numbering just short of 3000. This global event could not have happened with the superb team of volunteers who worked tirelessly from the inception of the sketchwalk, down to its conclusion as the sun set again on the Pacific Ocean. Social Media Managers were assigned different time zones: Eric Ngan reposted from the Oceania and Eastern Asia chapters; Minjoo Yoon gave us sights from Eastern Asia to the Mediterranean east coast; from there to Europe and the British Isles and the whole of Africa, Jeanne Edwards is the one to thank; Bindi Nasasira reposted from Europe and South America while the numerous North American chapters were split by Don Gore and Liz Vargas. Last, but not least, Noga Grosman is to thank as the community’s Social Media Coordinator. Don reports some interesting stats from the USk Instagram account: “Friday jumped to just over 522,000 impressions with Saturday going to over 1,900,000 (yes, that’s 1.9 million)”, just over 13 times more than the daily average impressions - that is, times that the posts show in the followers feed. While causing a lot of online interest, such intense events often have audience setbacks, as the account lost around 4,000 followers. “Some folks may have been overwhelmed by the number of posts showing up in their feeds in a relatively short amount of time”, Don explains, but still concludes that “lots of people viewed, and continue to view what was happening around the world”. “From the emails I'm still receiving now from sketchers who participated, it seems we were all amazed at how we are a part of such a big global community,” Bindi concludes. It’s a realization that makes us strive for ten more years of happy sketching! 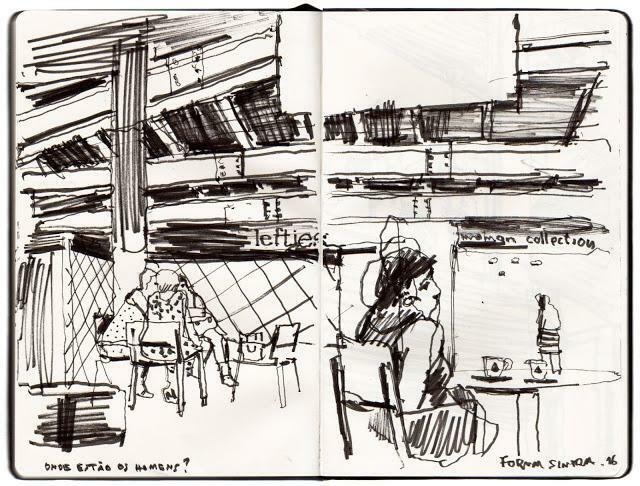 To view sketches on Urban Sketcher’s Instagram account, click HERE. 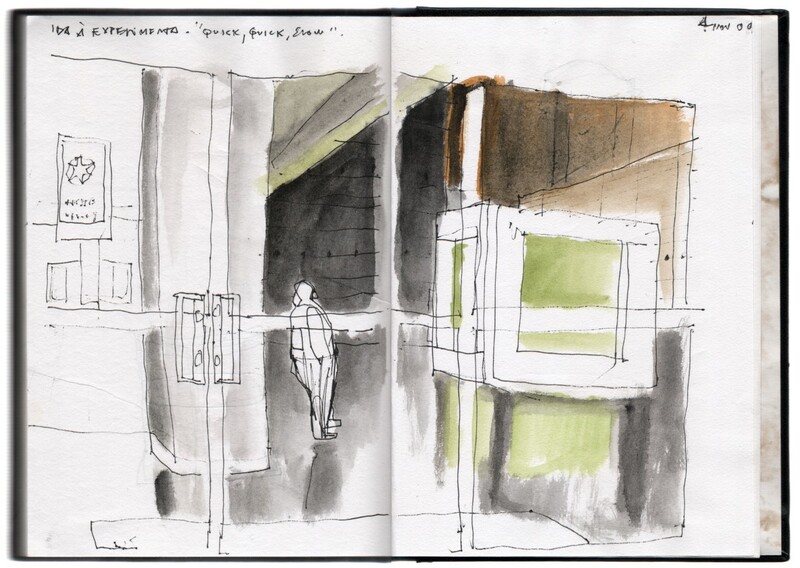 “A Day in the Life of an Urban Sketcher” celebrates the lives of sketchers around the world and how they share work online. 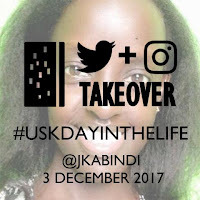 This monthly social media event will feature nine sketchers from six continents who will be sharing a day in their life in a USk Instagram and Twitter takeover. 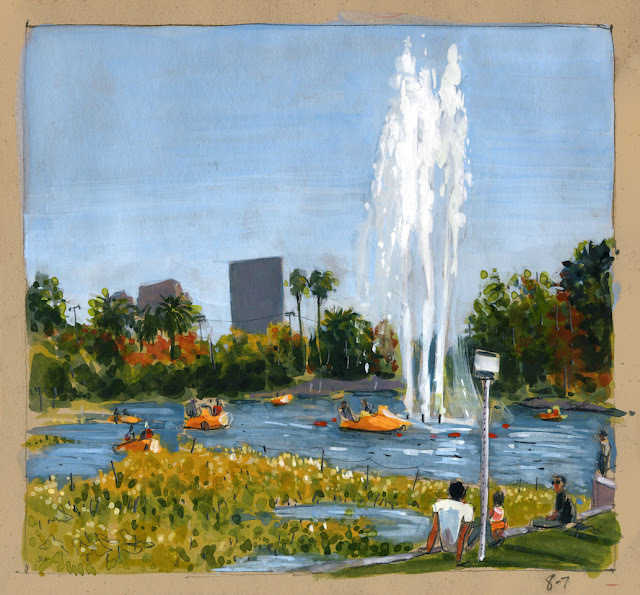 The featured sketcher will show their world, one drawing at a time by sharing approximately 6-10 posts on Instagram and Twitter during their day. 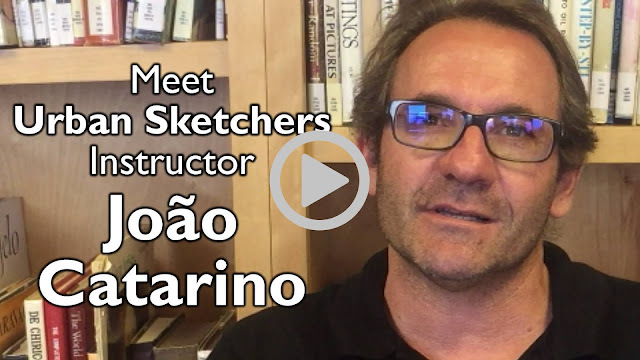 Watch Drawing Attention and social media for an introduction to each sketcher. Sketches will be archived HERE. 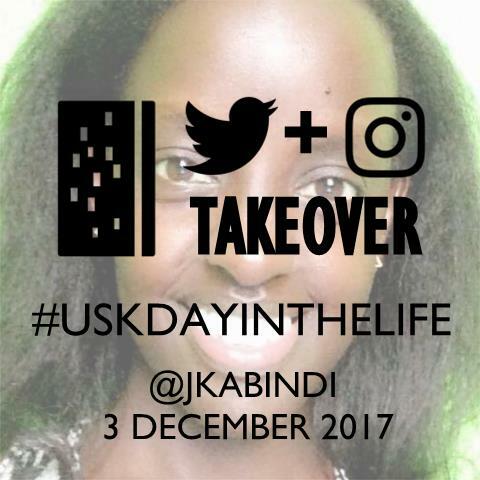 This month Urban Sketcher Bindi Nasasira living in Kigali, Rwanda will share her Day in the Life of an Urban Sketcher on December 3. Welcome to the Urban Sketchers family! As an officially recognized Urban Sketchers chapter you may wish to display our official logo. The logo can be adapted to your chapter according to this Logo Design Guide. You are not required to use our logo but if you do use a logo it should be the USk logo and no other. 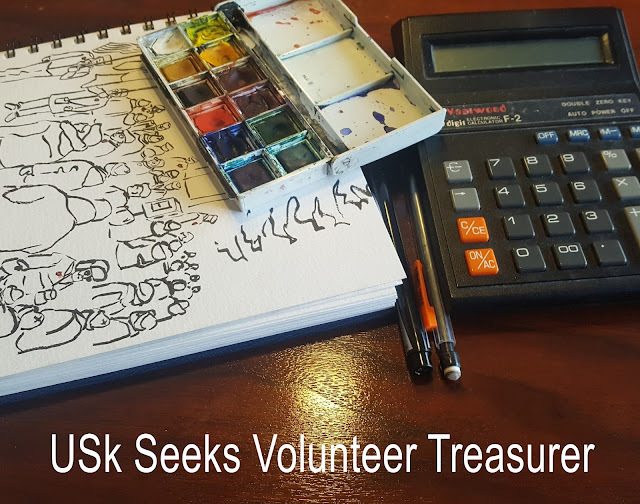 Are you considering launching a new USk Regional Chapter? Please become familiar with our Regional Chapter Guidelines available in 17 languages. While Urban Sketchers was launched online 10 years ago as a Flickr account and a blog, did you know that over 70% of USk chapters now use Facebook as their main platform? 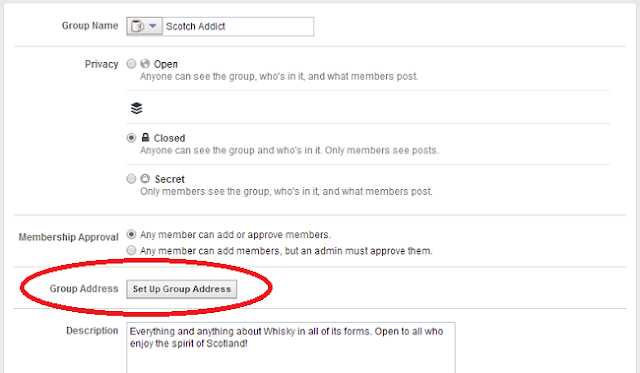 go to your Facebook group and look for the wheel/gears icon near the top. Click on the Set Up Group Address button and enter the vanity URL you want. Please note that the name can only be changed once. Born and raised in Portugal, João Catarino teaches drawing and illustration and design in three different art schools – and seems to have been attracted to opposites from an early age. Growing up in a family of scientists whose dinner table conversation often seemed like a foreign tongue to him, Catarino traveled an entirely opposite path, losing himself in long hours of drawing to express his individuality. Catarino advocates for a direct approach to drawing, emphasizing shapes without any prior contour markings as a means for creating a sense of immediacy. He teaches about observing the space we choose to draw, where errors in proportion and perspective happen easily – even naturally – but at the same time it is in the very plasticity of these distorted forms that we are likely to see and appreciate a greater authenticity. It’s that time of year again… time to find the perfect holiday gift for friends and family. What could be better than a new book about our shared passion, urban sketching! 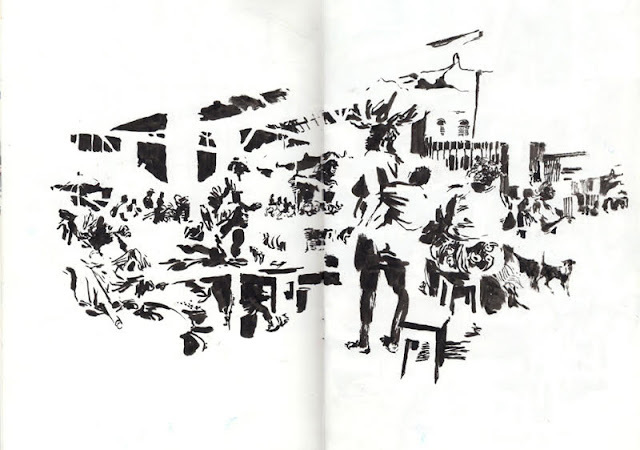 Here is a list of urban sketching books published this year by our own community members. Many apologies to authors whose work has been missed. Caderno da América Latina By Eduardo Salavisa. Language: Portuguese and Spanish. 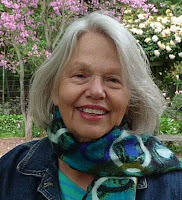 Virginia Hein drew from a wealth of artistic and teaching experience to present her workshop “The Color of Light in an Urban Garden” at the Chicago Symposium this summer. She’s a life-long California resident who worked in toy design for many years before becoming a college art and design instructor. Now she is generally busy teaching classes and workshops or out sketching on location. She is currently planning another USk workshop that she’ll probably hold first in Los Angeles and then take on the road to San Francisco and Seattle. It was in 2009, Virginia says, that learning about Urban Sketchers changed her life. 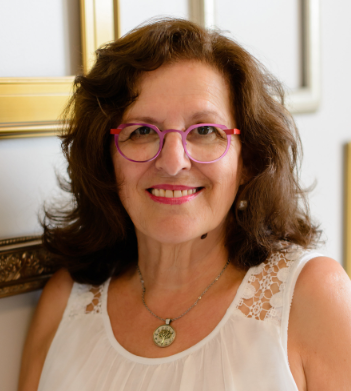 At the advice of Gabi Campanario, she rapidly became involved, becoming a correspondent and eventually giving workshops at three symposia to date! Virginia speaks warmly of the many wonderful friends she’s made around the world through USk. 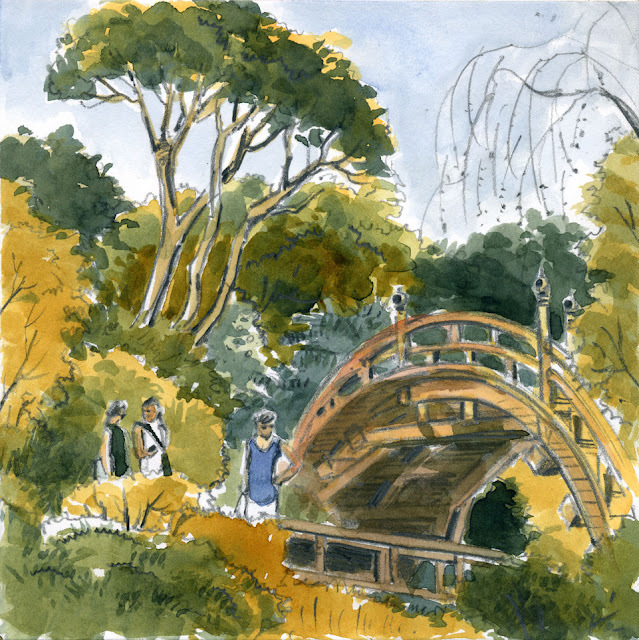 Virginia’s favorite type of outdoor sketching location is a city garden or park. For the Chicago workshop, for instance, she found her “ideal location”: an elegant formal garden framed by massive trees on Michigan Avenue, with the city skyline in the background. The variations of light, color, and distance were perfect for her lessons about monochrome contrast, using warm and cool colors, and being sensitive to the color of atmosphere. Virginia’s main challenge in teaching these exercises was making them accessible for both new and experienced sketchers. She advised participants to work in ways that were comfortable for them and pointed out that productive learning doesn’t always result in polished results. The basic ideas of this workshop—working monochrome to warm and cool and then adding a color—constitute a common underlying theme of her teaching. To read Virginia’s Chicago symposium workshop notes, click HERE. When he started his blog, “Alberti’s Window”, in 2007, former industrial designer, now high school visual arts teacher and master sketcher José Louro of Lisbon, Portugal had just finished his studies for a Masters Degree in drawing from Lisbon Fine Arts University. “I found that drawing is what makes me happy,” José explained. Gabi Campanario found the blog and invited him to join the USk international blog in 2008. Louro is a minimalist by design. “You can achieve better design through a minimalistic choice of materials and simplicity can emerge from the concept of minimalism…” His drawings express so much with so little; so it’s fitting that his workshop, “Draw Less, Show More” at the Chicago Symposium focused on creating the greatest impact through careful elimination and restraint. “I always try to understand what the other urban sketchers really want to know,” so Louro first asks students what their expectations are for the workshop. He uses the student’s needs as a guide to what he teaches. 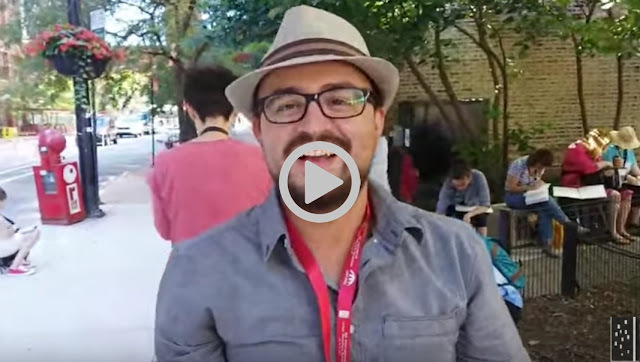 Get to know José a little better by watching this video. Contact us to share your chapter’s news, special events, joint meetups, and exhibitions with our readers. You don’t need to write the story yourself. 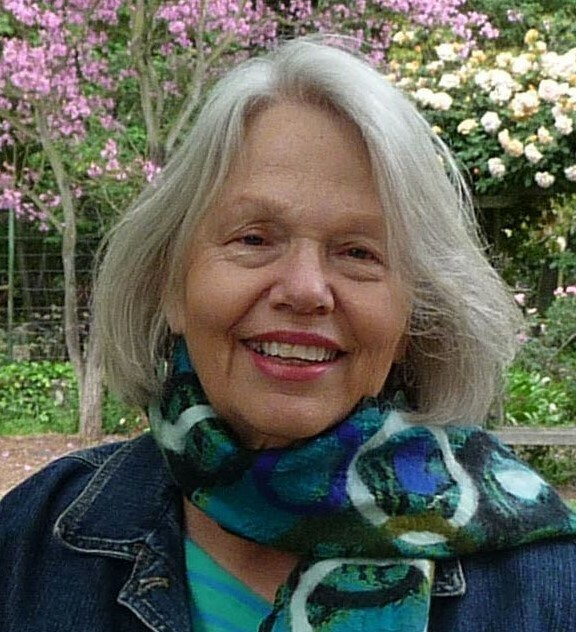 We will assign an enthusiastic DA writer like Jane Wingfield to cover your story! For João Catarino growing up with friends on the beach, surfing was – and continues to be – a vital influence: The presence of the sea or water in his drawings is a necessity. 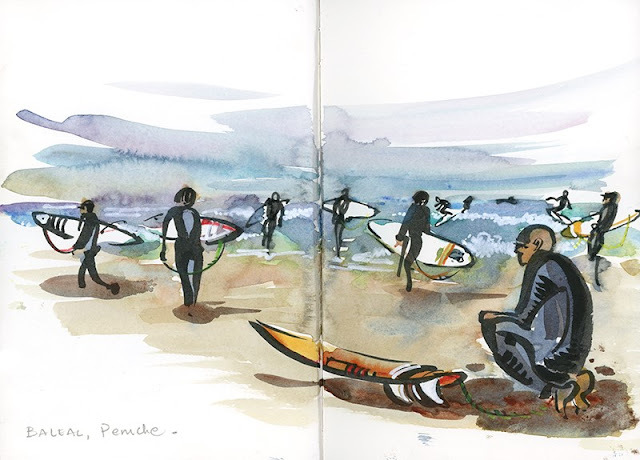 Perhaps it’s not surprising that the focus of his work during his recent adventure, Sketch Tour Portugal (STP) Oct 18-24, was to draw the best beaches and the best surf waves in the country, and to characterize the diversity of that environment. João, along with California-based urban sketcher Suhita Shirodkar, visited spectacular surfing beaches and surfing events during their packed 6-day STP road trip. 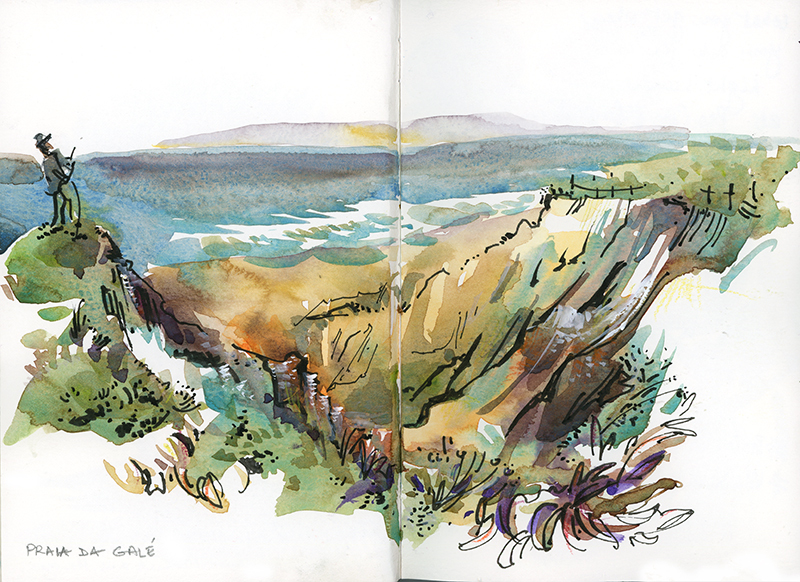 The sketching duo focused on the rugged coast north of Portugal, including Ericeira, a surfing reserve and Super Tubos beach in Peniche where they sketched at MEO Rip Curl Portugal, a worldwide surfing competition and the utterly breathtaking Nazaré, home of the largest surfing waves in the world. 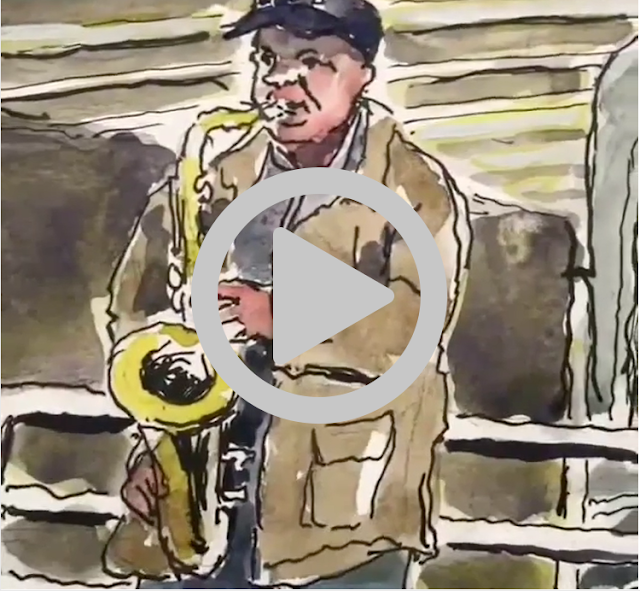 William’s Chicago workshop covered an approach to urban sketching that’s right in his comfort zone: tackling a complex urban scene and breaking it down into textures and shapes. Set up on location in Printer’s Row in Chicago, workshop participants were asked to analyze textures and shapes as compositional and graphic elements. Imagine looking at a cityscape, squinting your eyes and telling the story of what’s before you in the simplest graphic language. The workshop dove deep into a three-step approach of blocking basic shapes, then adding detail by using geometrical patterns, colors and textures, and finally some basic collage techniques, which always focus on textures and brings the drawing together. The results of William’s workshop process created many happy faces as these once-complex and grand scapes began to come together in people’s sketchbooks, and began to tell a rich story of textures and design. We hope to see William next year in Porto to once again share his passion for capturing complex urban scenes; in the meantime you can see the recap of last year’s workshop. 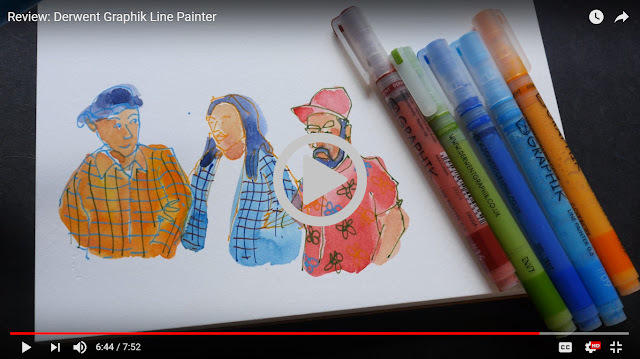 This month Parka video reviews Derwent Graphik Line Painter. Check it out! Did you know that if you make online purchases through Amazon, you have an opportunity to send a small portion of each purchase to support Urban Sketchers at no cost to you? Simply go to Smile.Amazon.com in lieu of Amazon.com and choose to support Urban Sketchers when you make your purchase. For more information, about Amazon Smile click HERE. Your opinion is important to us! As we are making plans and testing the technology in our secret research facility hidden deep in the mountains (just kidding. It’s actually 100% virtual) we would appreciate your feedback. Please take a moment to answer this question: What other content would you like to see us offer in Drawing Attention? Please send your brief answer to drawingattention@urbansketchers.org. Read the November edition of Drawing Attention. Thanks to this month’s Drawing Attention contributors.